On April 14, 2008, a Michigan federal district court judge granted the motion for preliminary injunction brought by Innovation Ventures, LLC d/b/a Living Essentials (“Living”) against rival energy drink maker N2G Distributing, Inc. and Alpha Performance Labs (together “N2G”) based on trade dress infringement by N2G of Living’s distinctive product packaging while rejecting Living’s claims for trademark infringement. See Innovation Ventures, LLC (d/b/a Living Essentials) v. N2G Distributing, Inc. et al., Case No. 08-CV-10983 (S.D. Mich. April 14, 2008). Living is the maker of a 2 fl. oz. 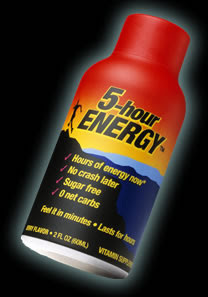 bottled energy drink called “5 Hour Energy” (pictured above). On June 14, 2004, Living filed an intent-to-use application with the U.S. Patent and Trademark Office (“PTO”) to register the mark 5 HOUR ENERGY (for homeopathic supplements, pharmaceutical preparations, nutritional supplements and dietary supplements that relieve or prevent fatigue) on the Principal Register. The PTO rejected registration of Living’s mark on the grounds that it was merely descriptive under Trademark Act §2(e)(1) (15 U.S.C. §1052(e)(1)) (the mark describes a specific characteristic of the goods, namely, providing the user with energy for up to 5 hours). Rather than attempt to argue acquired distinctiveness, Living apparently amended its application to register the mark on the Supplemental Register, rather than the Principal Register (this after it had already filed an Amendment to Allege Use that it began using the mark as early as June 2005). N2G makes and distributes a line of energy drinks called “Nitro2Go” (normally sold in 8.4 or 16 fl. oz. cans). In August 2007, N2G introduced a product called “Nitro2Go Instant Energy” in 2 fl. oz. bottles (announcement here). Living discovered N2G’s product at a trade show in early March 2008 after some trade show attendees apparently expressed belief to Living's representatives that Living was also the maker of the “Instant Energy” product. On March 7, 2008, Living filed its lawsuit against N2G alleging federal trademark infringement and counterfeiting, false designation of origin and trade dress infringement, and common law trademark infringement. On March 13, 2008, Living filed a Motion for a Temporary Restraining Order and a Preliminary Injunction against N2G. The court granted Living’s motion for preliminary injunction, but it did so based on trade dress infringement, not trademark infringement. The court, in analyzing Living’s likelihood of success on the merits (the first of the four factors the court must balance in deciding to grant a preliminary injunction), focused first on Living’s trademark infringement claim. Living argued a likelihood of confusion between its “5 Hour Energy” mark and N2G’s “6 Hour Energy Shot.” The court noted, however, that registration on the Supplemental Register does not provide the same benefits as registration on the Principal Register, and that essentially the registration provides no additional rights beyond what Living has under the common law. As such, the court first had to determine whether Living’s mark was distinctive or had acquired a secondary meaning. Living tried to argue that its sales and advertising figures as well as its 90% share of the two-ounce energy drink market (27 times greater than the next closest competitor) supported its argument that its “5 Hour Energy” mark had acquired a secondary meaning. However, the court found that Living had not carried its “heavy burden” at this point in demonstrating that the primary significance of Living’s highly descriptive mark to the public would be as a source identifier of the product rather than an identifier of the product itself. N2G also provided evidence of other two-ounce energy drink products from different manufacturers with such phrases as “7 Hour Energy Boost,” “6 Hour Energy!,” “Extreme Energy Six Hour Shot,” and “6 Hour Power,” which goes against Living’s argument that its “5 Hour Energy” has a strong secondary meaning that particularly identifies the source of the product. As such, the court found that Living had not demonstrated a “strong likelihood of success” on its trademark infringement claim to support its motion for preliminary injunction. With respect to Living’s trade dress infringement claim, the court first noted the U.S. Supreme Court’s distinction between trade dress cases involving product packaging (which can be inherently distinctive and thus no secondary meaning analysis is necessary) and product designs (which cannot be inherently distinctive). See Wal-Mart Stores, Inc. v. Samara Bros., Inc., 529 U.S. 205, 214-15, 120 S. Ct. 1339, 146 L. Ed. 2d 182 (2000). In addition, the court noted that to the extent that a product's overall trade dress is arbitrary, fanciful, or suggestive, it is still considered inherently distinctive despite its incorporation of generic or descriptive elements. See Paddington Corp. v. Attiki Imps. & Distribs., 996 F.2d 577, 584 (2d Cir. 1993). Living asserted that the following elements made up its distinctive trade dress packing for its “5 Hour Energy” drink: (1) a terrain climber at sunrise design; (2) color scheme (red, orange, yellow, and shades of blue); (3) the size, color, and font of the product name; and (4) the shape of the bottle (a short neck and a main container with broad shoulders). While N2G tried to argue that each of the individual elements of Living’s trade dress were either descriptive or generic, the court concluded that, although Living’s “5 Hour Energy” drink product packaging may have some generic and descriptive elements, the “overall product packaging image - the color scheme, fonts, and most significantly the graphical depiction of the landscape and figure –” constitutes an arbitrary, fanciful, or suggestive trade dress thatis inherently distincitve and thus can be protected from infringement without a showing of secondary meaning. Finding that Living’s “5 Hour Energy” drink product packaging constituted protectable trade dress, the court proceeded to determine whether the N2G’s trade dress is confusingly similar. While the court recited the likelihood of confusion factors used by the Sixth Circuit (citing Abercrombie & Fitch Stores, Inc. v. American Eagle Outfitters, Inc., 280 F.3d 619, 646 (6th Cir. 2002), the court decided to forgo doing a factor-by-factor analysis and instead focused on the fact that the Sixth Circuit recognizes a presumption of likelihood of confusion in cases where evidence points to “intentional copying” (where the intent of the copier is to piggy-back on the reputation of the product copied). See Ferrari S.P.A. Esercizio Fabriche Automobili E Corse v. Roberts, 944 F.2d 1235, 1242-43 (6th Cir. 1991). N2G attempted to focus on several different aspects of its product packaging as evidence that it did not copy Living’s trade dress; however, the court found Living’s evidence of intentional copying compelling enough – at least at this preliminary stage – to support a determination that the trade dresses of the two products are confusingly similar. The court specifically noted that N2G’s packaging contains the exact same color scheme, the same black-type italicized font for the logo, the depiction of a silhouetted athletic figure ascending a silhouetted mountain, and even copied Living’s “caution” warnings word-for-word. As for the other three factors the court must balance in deciding whether the grant a preliminary injunction, the court found irreparable harm based on the general presumption that irreparable harm arises when there is a likelihood of confusion (N2G apparently made no arguments against application of the presumption). The court accepted Living’s argument that the harm to its reputation and goodwill outweighed the harm to N2G in having to recall its product and redesign its packaging. Finally, the court held that the public interest in preventing confusion and deception in the marketplace and protecting Living’s interest in its trade dress weighed in favor of Living. With that, the court granted Living’s motion for a preliminary injunction. The court’s opinion is a little confusing with respect to N2G’s infringing trade dress. 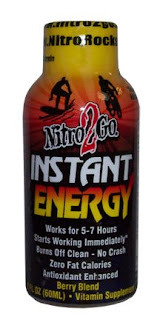 The opinion specifically points out in the beginning that N2G began distributing a product called “Nitro2Go Instant Energy” in two-ounce bottles in August 2007 (pictured above) suggesting that this is the infringing product (and one can see the similarities). However, throughout the remainder of the opinion, the infringing product is referred to as N2G’s “6 Hour Energy Shot,” including specific references to a hiker image and “6 Hour Energy Shot” logo on N2G’s bottle – neither of which appear in the above picture (I only see a surfer and bicyclist). So it’s not clear if the court’s decision is based on the bottle pictured above or if N2G had some other kind of product packaging that more closely resembled Living’s product packaging. If the former, then I’m not so sure I would agree with the court’s decision with respect to intentional copying and likelihood of confusion; however, if the latter, then the court’s determination as such may be justified. The date of the article above is "Monday, April 21, 2008," referring to a court decision on April 14, 2008, so one would think that the Nitro 2 Go company would have modified its website to redact and remove the products with that particular design -since, of course, the court is said to have ruled Dress Infringement. With respect to the shape of the bottle, that is definitely generic: MANY 2-ounce energy shots use that shape -no different than both Coke *and* Pepsi using the cola-shaped cans. However, I do realise there is some similarities in their colour schemes. Nonetheless, I would not hold there to be dress infringement due to the clear fact that the titles are different -not a small difference, I might add! On that basis alone, secondary meaning notwithstanding, I would have held that 5-hour Energy not be granted any such injunction -as this would, in my mind, have constituted very off-centre court-sponsored monopoly of not only that particular design -but (and more importantly) any *similar* design. So what if the designs are similar? They are not identical -and, with sufficient differences betwixt them, there is no infringement or coat-tail effect. It is the responsibility of the consumer to tell the difference: Caveat Emptor!